Matteo Zed has a lot going on right now. After winning the semi-finals in New York City, he is heading to London to compete in the Belvedere Vodka Martini Challenge. Belvedere is now the official vodka of the 24th James Bond movie ‘Spectre’ Starring Daniel Craig, Christoph Waltz, Monica Bellucci and Ralph Fiennes. The winner of the contest gets a vacation at the Goldeneye Resort in Jamaica (home of Bond creator Ian Fleming), plus their signature cocktail will be featured at the movie opening as it premieres around the world. Rumor has it they will also serve Bond his martini in the actual film! He isn’t worried. He knows that he can stick to his roots of traditional mixology. Others might try to wow the judges with fancy new flavors combinations. But let’s a face it, a drink is nothing without proper care and precision technique that is at the heart of traditional mixology. So no, Matteo isn’t worried about the Belvedere challenge. Nor is he worried about working in New York City. He was just offered a job bartending at the famous Del Posto, one of NYC’s finest restaurants. So what worries Matteo? What worries him most is the cost of living in New York City. Welcome to the club Matteo. 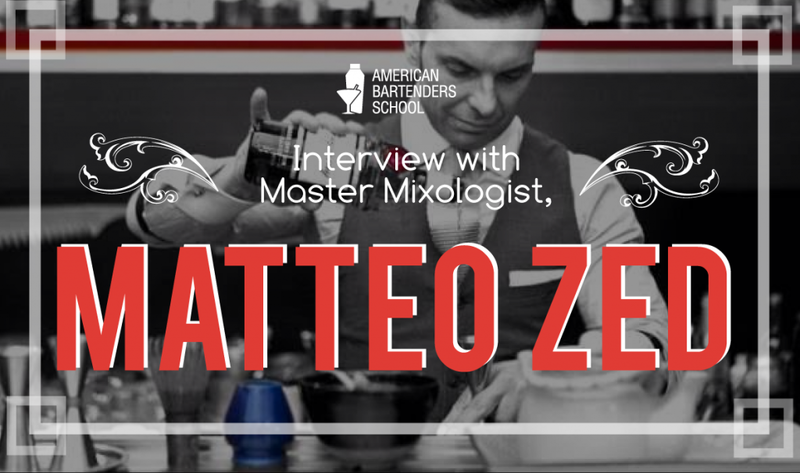 We got the chance to sit down with Matteo at American Bartenders School and ask him some questions. Where in Italy are you originally from? I am originally from Rome. Since your recent move to the US, what do you miss most about Italy? Obviously I miss my mother, like any Italian in the world. I also miss the friendly and joyful character of Italians. But I am a lucky guy because I have an amazing girlfriend and a fantastic group of friends here to New York. Where do you currently bartend? I currently work at ‘Del Posto’ in New York. How did you become interested in mixology? I’ve been doing this for a long time. I have experienced many transformations of mixology in the last 20 years. About eight years ago I really started to focus on using spices, herbs and roots in my cocktails. This wasn’t very popular in Europe, so I looked strange compared to other European bartenders. Over time I have refined my technique. I first worked for free in some kitchens at Michelin-Starred restaurants with some of the best chefs in the world. This is where I really learned how to extract the best flavors. I have also traveled extensively, working as a guest or employee in many places in the world. All of this has allowed me to improve and canalize all the energy and knowledge into a precise technique. But it also allows me each time to give a experience to my guest. I like to drink a shaken Americano (without seltzer) or also a classic Margarita. American Bartenders School Tip: To make an Americano, fill a highball glass with ice. Add 1.5 oz Campari and 1.5 oz sweet vermouth. Then top with club soda. Garnish with an orange slice or twist. We know that as a mixologist, bitters are very important. What bitters are your favorite to use? 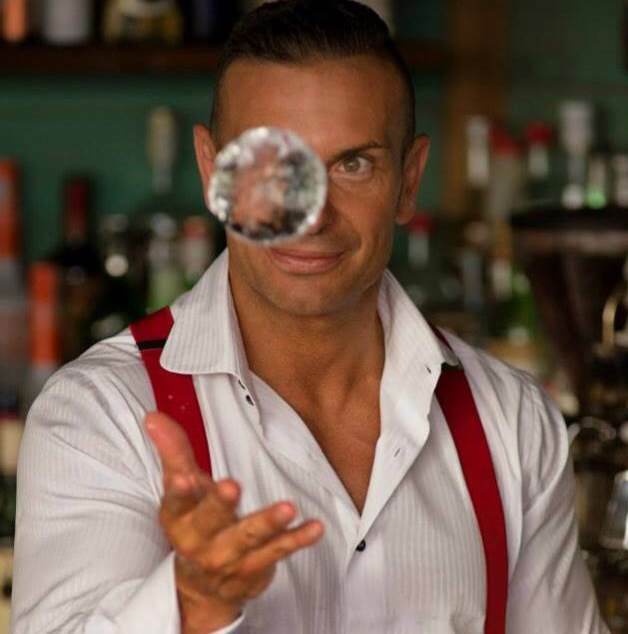 The Italian tradition is full of various types of bitters that I love to use in my cocktails. The best known, like the Fernet Branca, is fantastic if you add a few drops in the preparation of a Manhattan. Or try the herbal liqueur Strega Alberti to support gin in a dill bramble. You can try Rabarbaro Zucca, a famous rhubarb bitter, to complete a Negroni. Lastly, try using bitters with gentian in an aperitif cocktail with Cynar, fresh lime juice and tonic water. Since you are from Italy, we obviously have to ask a question about wine, so what is your favorite wine? I love the white wine served cold. I love white italian wines such as Vermentino from Sardinia, aromatic Traminer from Trentino Alto Adige or from Friuli Venezia Giulia and the Passerina From Marche. How did it feel to have won the semi-finals of Belvedere’s ‘The Challenge’ competition? It felt great. I treated it like it was a final. Winning such an important competition after only two months in America – with moments of my life being very hard – was very satisfying. It was truly the result of very long and hard work. But I have also learned that with each victory, it is important to always be humble and keep my feet planted firmly on the ground. Congratulations, I wish we could have tasted your cocktail! Now onto the question about vodka… How does Belvedere differ from other vodkas you’ve tasted? Belvedere Vodka is different. It is full of passion and personality. The production process is very meticulous and hard, and they only use pure and rare ingredients. It has an unmistakable aroma with hints of vanilla and notes of cream that differs from other types of vodka. Its taste is round and velvety. What could bartending schools do better to prepare students who wish to make a living bartending? To improve the preparation of students, bartendering schools must go beyond the normal education They must offer students new and advanced courses, so that they can be ready to face the modern bar industry. I believe all schools should teach a course on modern mixology where students could learn all of the new and modern techniques with the support of expert bartenders and chefs. What’s the craziest thing that has ever happened to you while bartending? I have been fortunate to work in Japan alongside Mr. Hidetsugu Ueno and very crazy things often happen in Japan. For example in Bar High Five, sometimes people drank so much that they fall asleep on the counter. Mr. Ueno always had a pillow and a small blanket ready for them. Since Belvedere is the official vodka of the James Bond franchise, we have to ask you this – What is your favorite James Bond movie? This is difficult to answer! But, I’m very fascinated by the first series with Sean Connery as the James Bond. Maybe the best in my opinion is ‘From Russia with Love (1963)’, where there is a great combination of beautiful scenes, beautiful women, and beautiful landscapes which combine to create a great action movie. Which actor is the best James Bond in your opinion? (Craig, Brosnan, Daulton, Moore, Connery, Lazenby)? Brosnan embodies the perfect James Bond – elegant, witty, agile and charming. He compiles the characteristics of all the others into a single character. Visit Matteo Zed at Del Posto. And don’t forget to root for him in the Belvedere Vodka Martini Challenge.